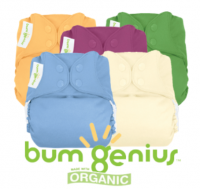 Insert into any pocket nappy, wrap or all-in-one for extra absorbency at night or during the day. Keep your baby fresh and dry. Complements any reusable cloth nappies. Better for the environment than standard disposable nappies. Less chemical content than standard disposable nappies. Made from sustainable bamboo pulp. How is this Bamboo Insert healthier for my baby? 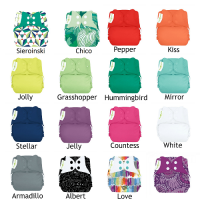 Reusable cloth nappies contain NONE of the harsh chemicals found in standard brand nappies. Bamboo is very absorbent and dries quickly. It is super soft, wicks moisture away quickly, and keeps your baby comfortable even when wet. How will it make my baby happier? We have made it super-absorbent to adapt to your baby's needs. Your baby will be comfortable and dry, day and night! And of course, being a healthier little one, due to less chemical content, your baby is certain to be happier! How will it make a better planet for our children? 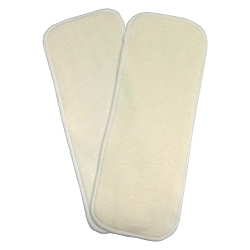 Using these inserts along with cloth nappies will generate 30% less Carbon than standard supermarket disposables. Each pack has two inserts. Insert size: 34cm x 25cm. These are ultra absorbent and so soft. I use them for overnights, they're brilliant!